… The Best-Known Presidential Dog to Never Have Lived in the White House. 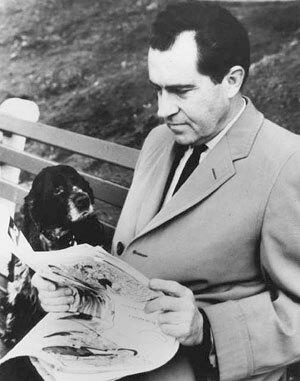 Although Nixon’s cocker spaniel never lived in the White House, Checkers became quite a celebrity after then-Senator Nixon mentioned the dog in a televised speech on Sept. 23, 1952. Nixon used the new medium of TV to take his case to the people to deny any alleged misuse of $18,000 in campaign contributions. The press learned of the fund two months after Gen. Dwight Eisenhower selected Nixon as his running mate, and a controversy developed that threatened the Republican presidential ticket. In a 30-minute address paid for by the Republican National Committee, Nixon defended himself, outlined his modest financial means and went on the offense against his opponents. The most famous part of the speech, however — and what may have saved his candidacy because of the chord it struck with the American people — was about Checkers. 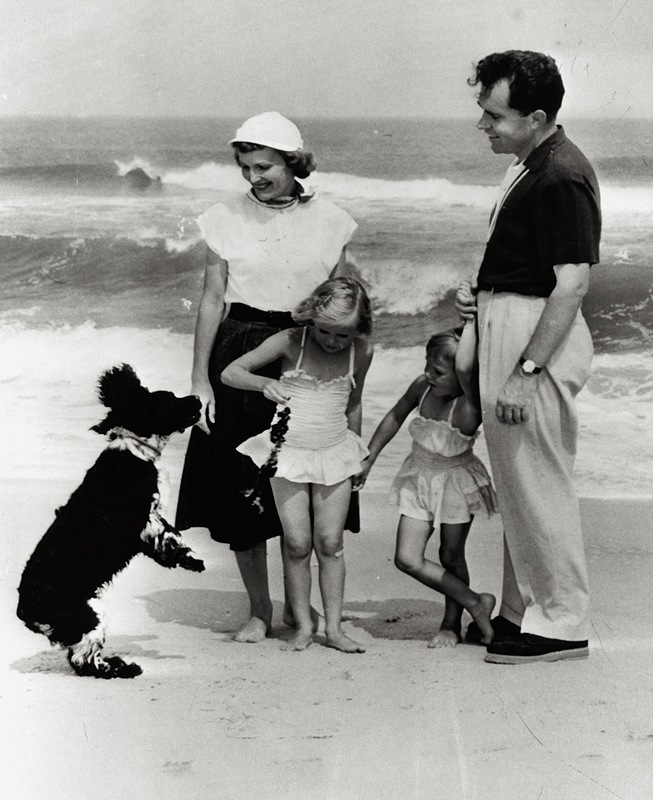 A year after Nixon’s famous Checkers speech, the family vacations in New Jersey as Checkers frolics. The daughters are Patricia at left, 7 years old, and Julie, 5. National Archives photo dated Aug. 16, 1953. 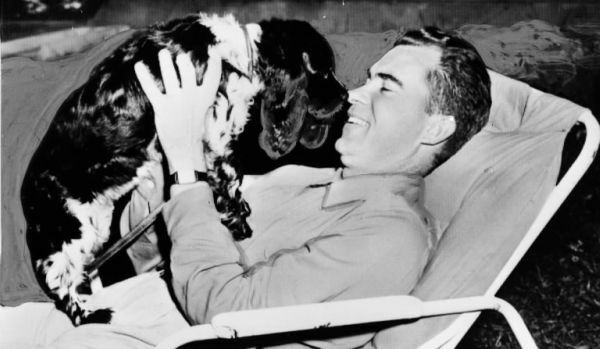 Nixon explained that no matter what happened as a result of the controversy, his young daughters, Julie and Tricia, were keeping one campaign gift: a black-and-white puppy from a supporter in Texas. The Checkers speech, as it came to be known, much to Nixon’s chagrin, was the first time a politician used TV to appeal to the voters — though the speech recalled Franklin D. Roosevelt’s speech about Fala eight years prior. Not only did Nixon stay on the ticket, but he and Eisenhower swept the election that November. Nixon, of course, eventually went on to become president and became embroiled in another, much bigger scandal that eventually ended with his resignation. Photo courtesy Richard Nixon Library & Birthplace. But what about Checkers? The cocker spaniel lived with the Nixons until he died at the age of 13 in 1964, four years before Nixon was elected president. Nixon reportedly kept a drawer full of dog biscuits in his desk. He enjoyed watching the dogs play and often requested that the dogs be let outside at dinnertime so that he could watch them while he dined on the Truman balcony. Why is checker buried in Wantagh?